Sadly, not long after Nicholas had become a priest, his parents died. Nicholas inherited a large fortune, because his mother and father had been very rich. He did not keep the money for himself but shared it with the poor. One day Nicholas heard about a man who had three daughters. This man was from a noble family, but he was very, very poor. The man had become so desperate that he was going to sell his three daughters as slaves, so that he could feed the rest of the family. Nicholas could not allow that to happen! So he took a bag of gold and went in secret to the man’s home at night. He tossed the bag through a window. Now the father had enough money to go looking for a husband for his oldest daughter. A few days later Nicholas secretly visited the house again and threw a second bag of gold through the window. That meant that the second daughter could marry too. The father, however, had become curious and wanted to know who was giving gold to his daughters. Some time later, when Nicholas tossed a third bag of gold through the window, the sound woke the man. He ran after Nicholas and recognized him, but Nicholas asked the father not to tell anyone his secret. The man and his three daughters were overjoyed, and the family celebrated and had a magnificent wedding feast. After many more generous acts and miracles . . .
People all over the world love Saint Nicholas because of the many miracles that he performed during his lifetime, and even from heaven after his death. and rejoice in our Lord above. 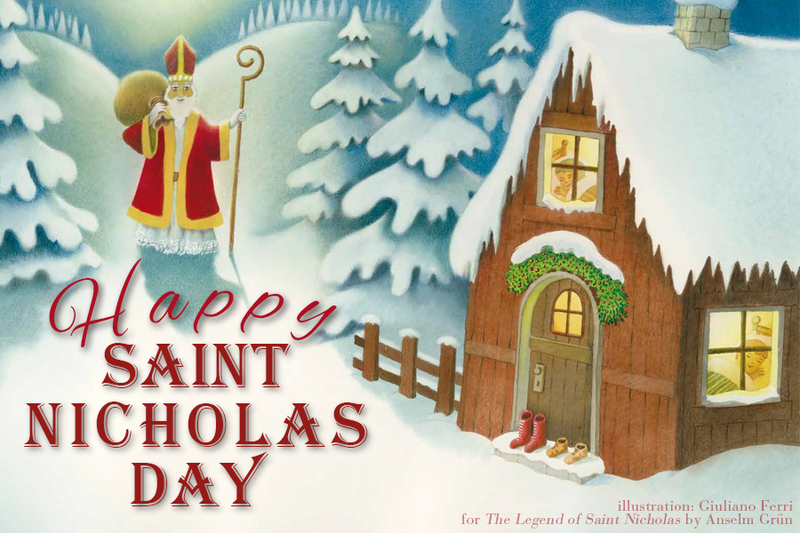 Click to order The Legend of Saint Nicholas.